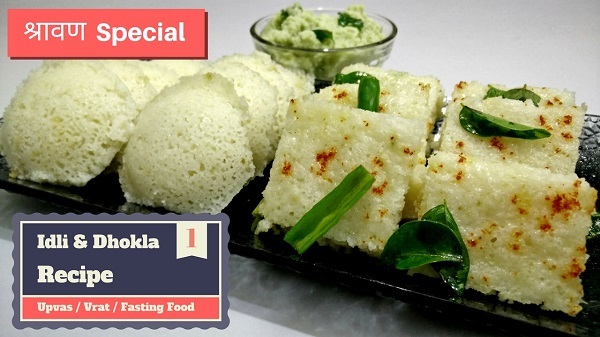 Here I am sharing a unique and Instant Idli and Dhokla Recipe for Upvas made from Moraiyo (Sama Ke Chawal) which you can eat for fasting or during regular days too. Moraiyo (Barnyard Millet / Sama Rice) used for making unique dishes during Shravan & fasting days in India. Follow this step by step recipe of How to make Upvas Idli and Upvas Dhokla at home. Coarsely grind dry Moraiyo and dry Sabudana in a mixer grinder. Remove the ground powder in a bowl. Add water as required to prepare the batter as we make for Idli batter. Keep aside and let it rest for 15 minutes. Meanwhile, grease the Idli stand with Oil. After 15 minutes, add Salt in the Batter and mix well. Divide the Batter into two equal portions, one for Idli and other for Dhokla. Add 1/4th tsp. Soda in one portion of the batter, mix well. After 10 minutes, switch off the Gas but remove Idlis from the cooker after 5 minutes. Remove Idlis from the Idli stand and serve hot. In the second portion of the Batter, add Ginger & Chilli Paste, Soda and mix well. Pour the mixture into the Dhokla Plate. Place the Dhokla Plate in the Steamer. Cover with the lid and steam Dhokla for 10 minutes. Switch off the gas but remove Dhokla after 5 minutes. Remove Dhokla plates from the steamer. Cut Dhoklas into small squares or diamond shaped pieces. For Tadka, heat Oil in a Tadka Pan. Add Green Chillies & Curry Leaves, let them crackle. Switch off the gas and spread the Tadka over Dhokla. 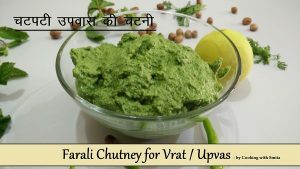 Serve Upvas Idli & Upvas Dhokla with Upvas Coconut Chutney; you can watch the recipe on my YouTube Channel.